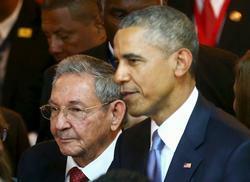 Equipo Nizkor - Obama Meets Raúl Castro, Making History. President Obama and President Raúl Castro of Cuba met here Saturday in the first face-to-face discussion between the leaders of the two countries in a half-century. Seated beside Mr. Castro in a small room in the convention center downtown where the Summit of the Americas was being held, Mr. Obama called it a "historic meeting." However, at a news conference wrapping up the summit, Mr. Obama also said that key steps in the normalization process would not be completed rapidly. He also said he was not yet ready to announce a final decision -- now widely expected -- on removing Cuba from the United States' list of state sponsors of terrorism. But he said the conversation with Mr. Castro had been "candid and fruitful," and he was "cautiously optimistic" that the relationship between the countries was headed in a new direction. And he said he had concluded that the best way to address the United States' disagreements with Cuba and other countries in the hemisphere on such issues as human rights and democracy was by engaging with them. "So often, when we insert ourselves in ways that go beyond persuasion, it's counterproductive, it backfires," Mr. Obama said, saying that was "why countries keep on trying to use us as an excuse for their own governance failures." Mr. Castro said he wanted a new beginning with the United States despite the two countries' "long and complicated history." He added that "we are willing to discuss everything, but we need to be patient -- very patient." The meeting on the sidelines of the Summit of the Americas was an important step for Mr. Obama as he seeks to ease tensions with Cuba and defuse a generations-old dispute that has also affected relations with the other countries of the region. Ever since his first foray to the summit meeting three months after taking office, Mr. Obama has seen one bone of contention frustrate his efforts to reach out to the United States' hemispheric neighbors: the fact that Cuba was blackballed from the gathering. He was scolded by Argentina's president for maintaining an "anachronistic blockade," lectured by Bolivia's president about behaving "like a dictatorship," and in 2012 blamed for the failure of leaders to agree on a joint declaration -- the result, his Colombian host said, of the dispute over Cuba. This year, Mr. Obama came to the summit meeting here determined to change the dynamic with a series of overtures to Cuba. In addition to the meeting with Mr. Castro, the gathering was the first time in the more than 20-year history of the summit meeting that Cuba was allowed to attend. "The United States will not be imprisoned by the past -- we're looking to the future," Mr. Obama said of his approach to Cuba at the summit meeting's first plenary session on Saturday. "I'm not interested in having battles that frankly started before I was born." "The Cold War," he added, "has been over for a long time." He said the shift in policy would be a turning point for the entire region. Mr. Castro, in a speech of more than 45 minutes that went well beyond the allotted eight minutes, spoke in unusually warm tones about an American president who has sought reconciliation with his country. But in a nod to allies like Venezuela that still support Cuba, he also delivered a lengthy diatribe on historical American injustices in the hemisphere. Mr. Castro said he had read Mr. Obama's books and praised his background as "humble." He saluted his "brave" decision to take steps against a trade embargo against Cuba by using his executive powers to loosen a host of travel and commerce restrictions. And he thanked Mr. Obama for vowing a "rapid decision" on removing Cuba from the United States government's list of states that sponsor international terrorism, a designation that has hobbled Cuba's ability to bank with the United States and some foreign creditors. Mr. Obama and Mr. Castro spent time during their hourlong meeting reflecting on the significance of the moment for Cubans, Americans and the entire region, said a senior administration official who would describe the private session only on the condition of anonymity. There was no tension in the room, the official said, but the two presidents did not agree on everything. While they both committed to opening embassies in each other's countries, Mr. Obama stressed what has emerged as a sticking point in the talks over opening an American embassy in Havana: ensuring that diplomats could move freely around the country. And Mr. Castro said he wanted to see the United States trade embargo against Cuba lifted, which Mr. Obama has called on Congress to do. At a news conference, Bruno Rodríguez, the Cuban foreign minister, said his meeting with Secretary of State John Kerry on Thursday, and Mr. Castro's with Mr. Obama, allowed the countries to draw closer. "A principal result is that these two governments now know each other better," Mr. Rodríguez said. "We have a better understanding of our common ground, a better idea of our mutual interests"and "better knowledge of the scope and depth of our differences." For Mr. Obama, the summit was a chance to showcase progress toward a goal he aspired to during the first Latin American summit meeting he attended -- where he spoke of a "new beginning" with Cuba even in its absence -- and to clear away what had become a dysfunctional subtext of the meeting for generations of American presidents. "Our Cuba policy, instead of isolating Cuba, was isolating the United States in our own backyard," said Benjamin J. Rhodes, Mr. Obama's deputy national security adviser for strategic communications. "This time, we arrived here, yes, certainly not agreeing with everybody on everything," he said, but with "broad agreement with the leaders here that what the president did was the right thing. "It is going to open up the door not just to greater engagement with Cuba, but potentially more constructive relations across the hemisphere," Mr. Rhodes said. Several Latin American nations have criticized recent United States sanctions against several Venezuelan officials it has accused of human rights violations. But Mr. Obama's overtures to Cuba, as well as his recent executive action on immigration, to make it easier for some people who are in the United States without authorization to stay legally, have brought an unusual round of salutes and congratulations. "President Obama is going to leave a legacy the way he is supporting Hispanics in the United States, and also his new policy for Cuba for us is very important," President Juan Carlos Varela of Panama said just before meeting with Mr. Obama at the summit conference. President Juan Manuel Santos of Colombia, who demanded Cuba's inclusion in this summit meeting as he closed the last one, in his country in 2012, also celebrated Cuba's arrival. "The Cuba situation has been an obstacle going back a long time in the relations of the United States with Latin America and the Caribbean, and without that obstacle the cooperation on many fronts will be more fluid," he told the Colombian newspaper El Tiempo before arriving here. It was a far cry from the last Summit of the Americas in 2012 in Cartagena, Colombia -- marred by a prostitution scandal involving Secret Service agents -- when some Latin American leaders openly berated Mr. Obama for the United States' stance on excluding Cuba. Bolivia, Nicaragua and Venezuela said they would not attend again unless Cuba could. The president ended that gathering with a testy lament, seemingly irritated by his inability to move past old disputes. "Sometimes those controversies date back to before I was born," Mr. Obama said in his closing news conference, adding that it felt at times as if "we're caught in a time warp, going back to the 1950s and gunboat diplomacy, and 'Yanquis' and the Cold War, and this and that and the other." The meeting was not without tension or reminders of the old animosities. It was marred by several clashes in the streets between Cuban dissidents and government representatives, one of whom accused the demonstrators of being paid by foreign governments, including the United States. And President Nicolás Maduro of Venezuela came to the summit armed with a petition demanding that Mr. Obama lift sanctions that he imposed by executive order last month on members of the country's government for human rights abuses. Mr. Maduro brandished the papers as he railed against what he called a "dangerous" decree that interferes with Venezuela's internal affairs. "I respect you, but I don't trust you, President Obama," he said in a profanity-laced speech. But longtime observers of the region said Mr. Obama's move had robbed hemispheric neighbors of an oft-repeated knock against this American president and his predecessors. "It opens the door for the U.S. government by removing this argument that has been a pretext and an issue that has been invoked, not only by Cuba but other countries in the region, as a distraction," said José Miguel Vivanco, the director of the Latin America program at Human Rights Watch. "The focus has been for so many years on the U.S. policy toward Cuba, not on the record of Cuba," he added. "This puts the U.S. government and the Obama administration in a very different position with much more credibility when it comes to talking about democracy and human rights."